Spices are your secret weapon in every dish you prepare. The more you have, the better. But, you might realize that it can lead to clutter. Therefore, you need spice rack ideas that help you organize your spices well. Read on to find 8 effortless spice organizing ideas that spruce up your kitchen. Stainless steels are well known for their sturdiness and durability. No wonder most of the kitchen appliances are made of stainless steel even your storage rack. This small stainless-steel storage rack is all you need to keep the clutter at bay. Instead of putting your go-to condiments on the countertop which can make it look messy, it would be better if you store them in this rack. The sleek design of the rack suits the clear tiny glass jar perfectly, making them a perfect adornment for the plain wall of your kitchen. Just hang it over the countertop so you will be able to grab the spices you need in a jiffy. The sleek design suits modern kitchen well. It helps you get the spices you need quickly. The rack can only be occupied with 6 tiny jars so you cannot put all of your spices on the rack. You can only put your go-to spices there. What do you want to fill in the bland wall in your kitchen? A colorful painting? Or a storage rack? Or maybe both? A magnetic spice rack may be something that you can rely on in your kitchen. It is a piece of plate that holds magnetic canisters in place. Some brands even include a label on each lid of the canisters, helping you recognize the spices better. The magnetic canisters are made of clear glass that allows you to see what is inside. Besides, the colors of the condiments and spices add pops of natural colors to your kitchen. If you have too many spices in your tiny kitchen, it will be hard for you to store them all without cramming them in your cabinets. Try a better idea by making use of the most awkward space you have between the wall and the fridge. A pull-out shelf can be your best bet when it comes to an awkward space. But it needs you to harness your carpentry skills in making the shelf because you cannot find the best one that fits this space perfectly. It does require some measurements. Once the shelf is done, you can store as many spices as you want neatly. And you do not have to break a sweat in getting the spices. Just pull the shelf out, get the spices, and push it back. Thanks to the tiny wheels that allow it to glide on the floor. Making your spices out of your sights is the best way to eradicate clutter. The awkward space does not allow you to make a bigger rack. And if you do not pull out the rack carefully, you will drop your spice jars. You may want to store your go-to spices on the countertop or in a hanging rack over the countertop so you can get them easily. But, what about the other spices? You can store the spices that are not frequently used in your cabinets. But if there is no room for them, you can hang them over the cabinet’s door. You can also hang the spices in many ways. You can invest in wire racks or these spice gripper clip strips. You will just need to affix the strips on the door and you can begin to store your spices. The strips might look fragile and be prone to breakdown. Well, it is sturdier than it looks. Some brands feature a super secure adhesive that allows you to mount the strips to any surface you want. Another creative way to save the day and your money is by an upcycling wooden crate. You will be surprised when knowing what a well-worn wooden crate can do to your kitchen. And this is one of the most creative ways of using a wooden crate. To get this look, you just need to find an unused wooden crate, do a little tweaking, and turn it into a wooden spice rack. Not only does it hold your spices in place but it also makes a great focal point. Storing spices on some stackable tray can really save a lot of the valuable space in your small kitchen. However, it will be hard to find the spices you need without moving the whole trays especially if you put it on an open shelf. To overcome this problem, you can make a spinning rack consisting of three to five rotatable trays. Finding the black paper and turmeric powder will be easier because you will just need to rotate the trays. Do you want to add a little bit of rustic style in your kitchen, but you still want to maintain the modern look? Try using a dry tree branch in place of a stainless-steel rack in your kitchen. 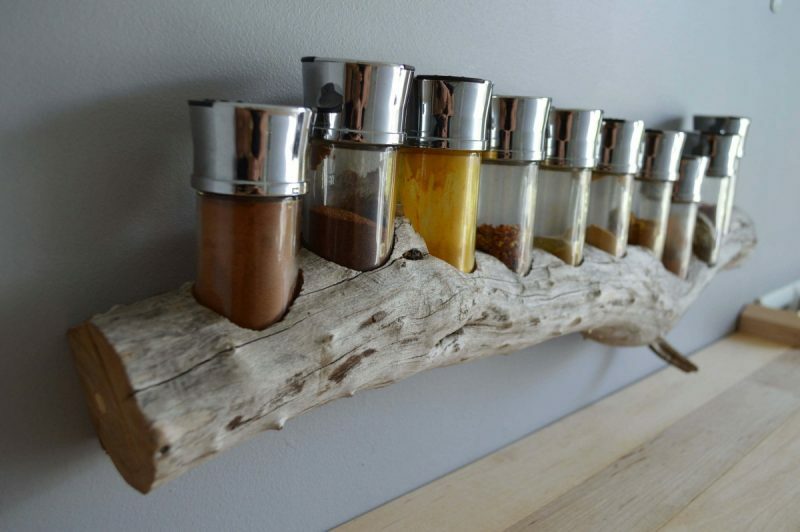 You can get a tree branch for free in your backyard, but make sure you strip and finish it properly before using it as a decorative spice rack. Once you have stained the branch, make some holes that fit your spice jars perfectly. After that, hang the branch on the wall and put the spice jars into the holes. If your cabinet is full already, do not cram your spices with a jumble of jars as you will not be able to find the spices easily and quickly. You will even have to unload your cabinet to find chili powder. Instead of cramming the spices, why don’t you buy an additional rack installed under the existing cabinet? If doing carpentry stuff is not your thing, just get this rack in home-improvement stores near you. As one of the most essential ingredients of the dishes you prepare, you should pay careful attention to how you store them. These spice rack ideas are worth trying. They are easy to make and ensure your kitchen is clutter-free.